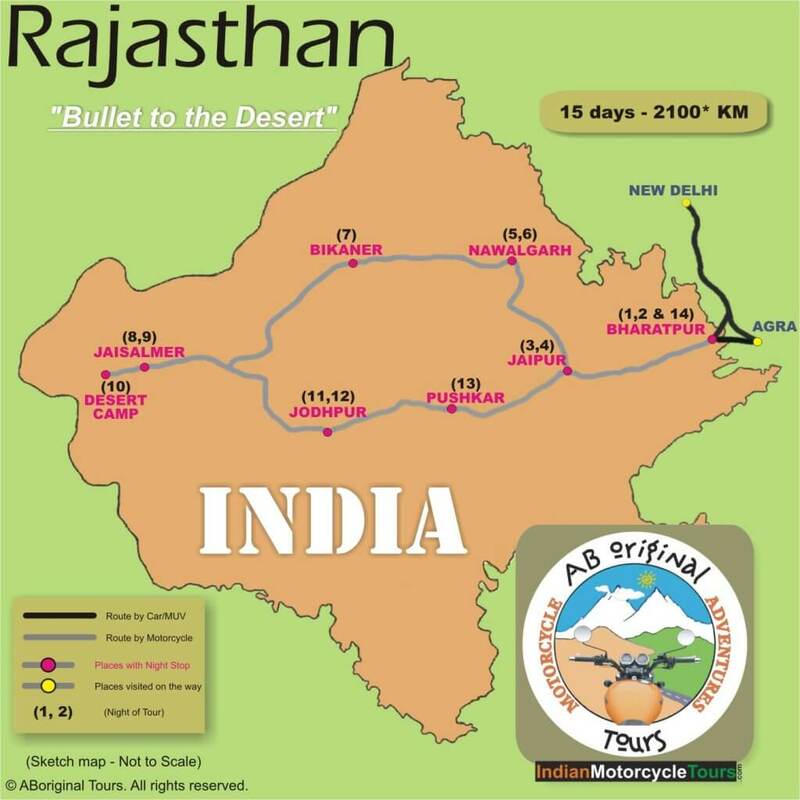 Below is a day-by-day itinerary for the “Bullet” to the Desert Tour. This is how we expect the tour to flow, but as you know…adventure happens! Dive in and get excited! 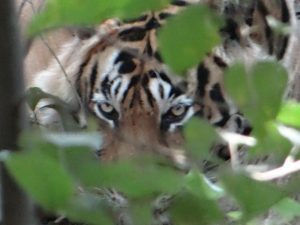 Early morning you’ll have time to visit the Keoladeo Ghana National Park and do some bird watching. Soon after breakfast, we’ll ride to Deeg. This ride will be a good introduction to your bike and the riding conditions. In Deeg, the night is all yours. Don’t forget to visit the palace! Leaving Jaipur, you head north-west on the NH-11 towards the Shekhwati region, to the town of Nawalgarh. Referred to as the “open air art gallery” of Rajasthan, the entire Shekhawati region is dotted with fascinating mansions (havelis) embellished with frescoes & colourfully painted walls. You may either explore the town or use the day for rest/relaxation. Alternatively, if you are keen to ride, we’ll be organising a short ride in the surrounding region (optional). 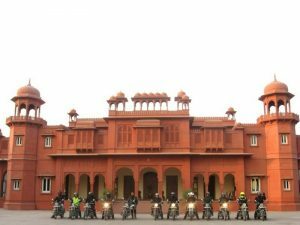 Joining the NH-11 again, you’ll head westwards towards the city of Bikaner, one of the famous desert cities of Rajasthan. Bikaner’s spectacular landscape is dominated by the indomitable Junagarh Fort and the red sandstone Lalgarh Palace both of which you’ll visit today. The afternoon can be well utilised to visit the old city. Today we turn south-westwards on NH-15 and head for Jaisalmer, another beautiful desert town located in the Thar desert. It’s the longest riding day of the tour so we’ll have rest stops at Phalodi, for a lunch and stop at the nearby village of Khichan to see hundreds of migratory Demoiselle Cranes. We’ll reach Jaisalmer just in time to see the sunset behind the “Golden Fort”. The day is yours for visiting the “Living Fort” (yes, it’s the only fort with a fourth of Jaisalmer’s population living within its walls) and other inquisitively carved mansions which make for some of the most beautiful buildings in the state. After spending the morning in Jaisalmer, we’ll move further into the Thar desert. 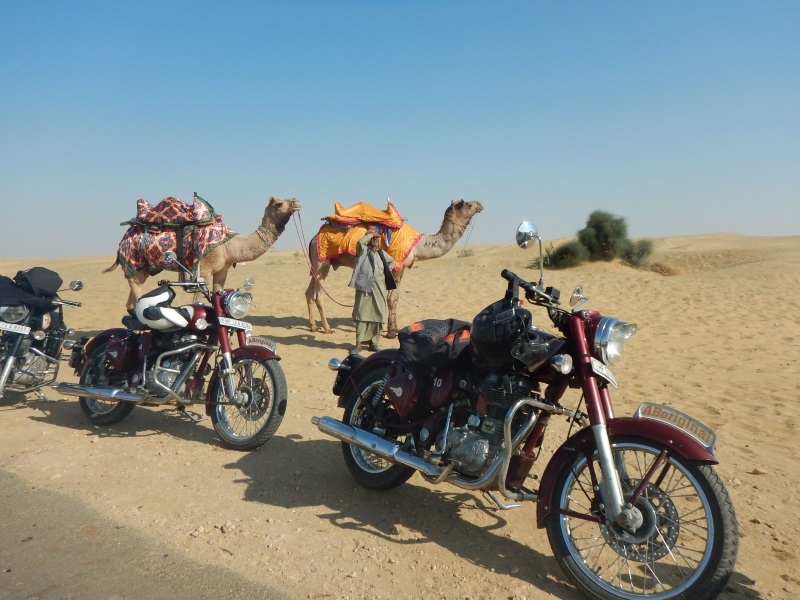 A couple of hours ride through the desert villages around Jaisalmer brings you to the desert camp where you will spend the night. Accommodation is in a comfortable campsite, where you can ride Camel into the Sunset and experience Rajasthani music & dance. Continuing eastwards you’ll make your way to Jodhpur, one of the most spectacular destinations in Rajasthan. 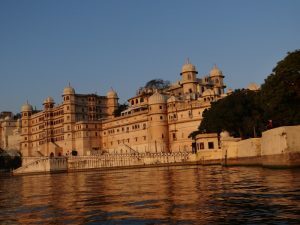 The day is yours to visit the places of interest like the Mehrangarh Fort, Umaid Bhawan Palace & Jaswant Thada. Leaving Jodhpur, you’ll head north east to Pushkar, a holy town famous for its lake, various ghats and temples spread all around it.